The Research Experience for Undergraduates (REU) and Wadsworth Center’s Master of Science in Laboratory Sciences (MLS) Programs welcomed interested students to their annual open house. Faculty, laboratory staff and program graduates were on hand to meet with prospective students and present posters describing their research studies. Students were given a formal overview of the REU and MLS programs, mingled with faculty, students and researchers, and toured the laboratories. The event was attended by students from seven local colleges and universities. Several students interested in the REU program had already started the application process, and others were coming to find out more about the program and how to apply. “The Open House is a great opportunity for undergraduates from the area to come in to Wadsworth, see the labs, and find out about the research opportunities open to them. It gives me an opportunity to encourage students to apply, especially those under-represented in the sciences and those from some of our local community colleges, both underserved populations that we’re trying to reach”, says Dr. Matthew Kohn, REU Program Director. The Wadsworth Center has hosted a National Science Foundation-funded REU summer program nearly continuously for over 25 years. The program has trained more than 300 students. For 2017, Wadsworth Center is running a modified program, comprised of students supported by NSF and other funding sources, as well as volunteers in the laboratory. The program will consist of a weekly scientific seminar series, plus an end-of-summer student symposium. All summer undergraduates working in Wadsworth Center are invited to participate. The MLS Program is a two-year, full time program combining lecture-based course work with direct laboratory training. Students gain hands-on experience in public health investigations related to infectious diseases, environmental assessment and genetic testing, with specific emphasis on laboratory management. Graduates of the MLS program are well-equipped to investigate complex public health questions, conduct laboratory analysis with cutting-edge tools and technology, and respond to everyday challenges in public health. “Students always enjoy the lab tours, and it gives them the opportunity to learn about the exciting work public health laboratorians do every day. 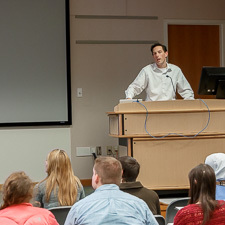 This year, the Applied Genomics Technologies Core demonstrated how they use cutting-edge technology to rapidly characterize antibiotic resistance profiles of drug-resistant mycobacteria that cause tuberculosis, and to identify, track and monitor the bacteria that were responsible for the Legionnaires’ disease outbreak in 2015 in New York City”, says Dr. Denise Kay, Chair of the MLS Program Recruitment and Admissions Committee. Both programs are housed within the Wadsworth Center, one of the largest and most comprehensive public health laboratories in the United States. More information: www.wadsworth.org/education.